awsome! cool pic of tsume and kiba! One of the best scans I've ever seen. Thanks. I LOVE kiba!! and this is by far the best scan ive seen of him! arigato gozaimashite for the pic, bub! I know I'll take any pic I can get from this show. Its soo good. Thanks for this picture! very nice scan about Wolfs Rain, this anime is really good! O.o!!!! 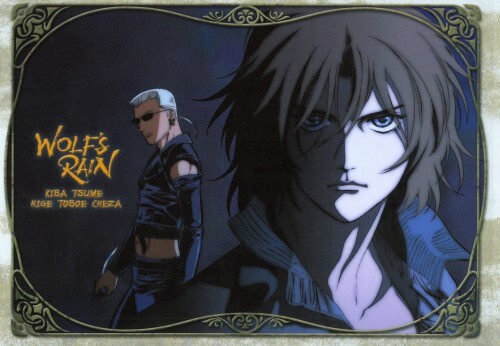 What a great image of Tsume & Kiba from Wolf's Rain!!!! I really LOVE this image!!! Kiba & Tsume looks sooo great in it!!! I always wanted to have this image in high quality!!! One of the best scans I've ever seen !!!!! Thanks for submit it ! Dios!!!! pero que hermosa imagen. Me encanta ya no se que decir, es perfecta!!!!!! Kiba is so cute on this scan. Thanks for cool scan. Thanx but don't you thing Kiba here really does not look like Kiba?